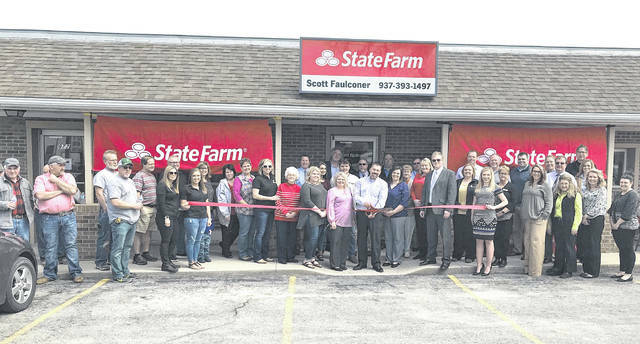 The Highland County Chamber of Commerce welcomed Scott Faulconer State Farm with a ribbon-cutting at its open house on April 4. Attendees of the open house enjoyed some windy, but warm weather and a delicious lunch of BBQ pork and sides. Faulconer and his team opened their office at 972 W. Main St. in Hillsboro on Feb. 1 this year. Along with Faulconer’s family and friends, Chamber Board President Randy Lennartz and Mayor Drew Hastings welcomed Faulconer to the Chamber and the City of Hillsboro, and wished him success in his new business venture. The agency takes care of your home, auto and life insurance needs and offers financial services such as banking and mutual funds. For quotes or more information call the team at 937-393-1497.